Begun, the beer wars have. Actually, this has been happening for a while now. Big commercial brewers versus the little guy. Big commercial brewers buying up the little guy. Big commercial brewers trying to trademark beer lingo like radler. And everyone hates them for it. 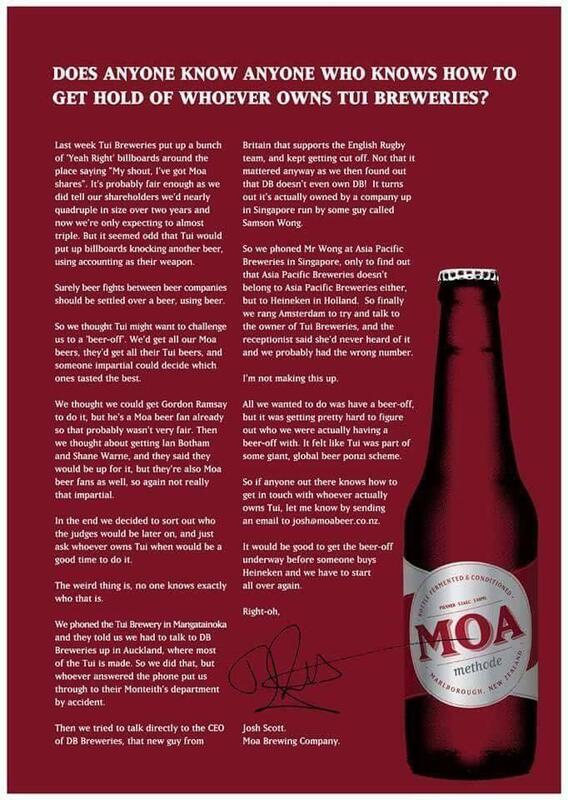 So when Tui attempted to bully Moa brewery a few years back, Moa stood up for themselves in a deliciously brilliant way. While they are not the littlest guy, let's call them a mid-strength brand. They are on the NZ share market, and at the time of Tui's dig, there was nothing spectacular about their share price but they were slowly picking up sales around the world. Either way, the diss Tui made as part of their famous yeah right campaign was worty of a retort. If you haven't read the above very word image, do it now. You'll see the story play out really well. Moa is making the point that Tui is part of a world conglomerate where there a layers of corporations and SHAREHOLDERS. So attempting to pick on a small fish for their share performance is somewhat ironic and amounts to a form of corporate bullying. It's also amusing as if we are comparing the flavour of Tui to Moa's product, it's this humble drinker's opinion that Moa has the superior product range. Sure, Tui was a beer I swilled back in my University days (where my Speights drinking mate used to say of Tui beer, "Tui is a bird and let's leave it at that". And that's about what it's still great for, binge drinking at a Uni Bar or a party or summer BBQ somewhere. Hey don't get me wrong, Lion Nathan who is owned by mega-sized Japanese company Kirin still make Steinalager, which despite its massive commercialization, it's one of the best beers around. Other drinkers will disagree but for this drinker, there's something really special about that first taste of a cold bottle at the end of the day. Is 'Alkaline Brewery Wash' better than PBW? 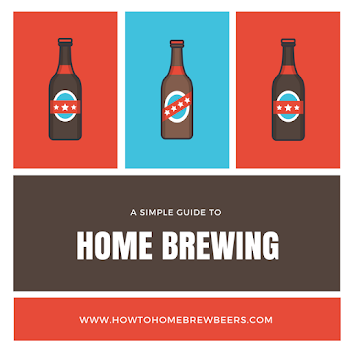 What are adjuncts used for in beer brewing?